Black pepper with botanical name "Piper nigrum" is the world most traded spice and is found in almost all parts of the world and in everyone's kitchen. Black pepper is primarily used in the kitchen to add spice and flavour to our food. But are you aware that there much more to this tiny black seeds than just adding taste to your food? The health benefits of eating black pepper include relief from respiratory disorders, coughs, seasonal cold, constipation, indigestion, dental disease and much more. Below are some of the reasons why you should sprinkle this spice more often in your food. The piperine in black pepper eases digestion and stimulates the stomach, which then secretes more hydrochloric acid that helps to digest proteins in food. It stimulates the taste buds to signal the stomach to produce more acid. Stomach acid is essential for digestion as it helps breakdown foods and the acidity triggers the release of digestive enzymes that help complete the digestive process. So a bit of pepper in food actually helps to digest it faster. Besides adding flavour to your food and promoting digestion, black pepper works as an appetite stimulant. According to research, the use of this spice in our food helps in improving the appetite through olfactory stimulation. This makes it an excellent, simple remedy for those with a poor appetite. Do you know that crushed pepper is one of the best exfoliators nature has provided us? It can be used when added with a bit of honey, curd, or fresh cream to it. It also enables blood circulation and provides the skin with more oxygen. Crushed pepper when added to a face scrub, helps slough off dead skin, stimulates circulation and helps deliver more oxygen and nutrients to the skin. The compound piperine in black pepper increases the cognitive function of the brain and helps beat depression. It stimulates the brain and helps it to function properly by making it more active. 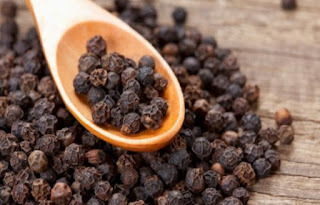 According to Ayurvedic medicines, the use of black pepper helps to prevent earaches as well besides helping in a hernia and insect bites. In many regions, black pepper is effectively used in tooth decay and toothaches. In ancient times, this herbal spice was used by many to treat vision-related problems. The Health benefits of eating black pepper cannot be overemphasized, these are just few of them. Kindly share this information with your friends by using the social share icons below.